Change can be unsettling. From leaving home for the first time to switching jobs to learning something new, change is unknown and uncomfortable. I found out today that a colleague is moving on to another role. Not only am I coming to terms with the fact that I’ll be saying goodbye to a friendly face in the office, but it will mean taking on new responsibilities and adapting to a new workload. It’s unknown and uncomfortable for me – and I’m sure for my colleague too. But change is also possibility, opportunity, destiny. It’s about new beginnings, making mistakes and learning from them. It’s where the magic glows and strength grows. We should always be changing, even if it’s just the little things like our route to work or morning routine. It keeps our minds active, receptive and thriving. I’m going to be less afraid of it, and instead, embrace it. We’re all on a journey. Sometimes we map it out on paper, but we cannot always follow it on the road. A fallen tree. A fork in the road. A dead end. A mountain to climb. A dark night. There are twists and turns that drive us off course. And that’s ok. We cannot control everything around us. But what about the times when the only thing in our way is ourselves? It happens to me all the time, even if I talk myself into thinking it’s not. The self-doubt. The procrastination. The high expectations. These can be crippling to the pursuit of my passions and goals. Maybe yours too. I know I can do better. And that’s what I am going to commit to doing. These pages are my way of sharing my story, the mistakes and the pitfalls, the lessons and the successes. For me and for you. Thank you to the lovely Kez Gutierrez (http://thelittlenovice.wordpress.com) for nominating me for the Liebster Award! This award has been designed by bloggers to show support to other bloggers, and it’s a great way to get to know one another a little more. 1. What is your favourite thing about blogging? Being able to inspire, interact with and learn from people all over the world. 2. Who would you dedicate your blog to? Honestly, everyone; those who feel lonely, lost, discouraged, or hurt, to those who want to take control of their lives, to those who want to learn and grow, and so many more. 3. What is/are your biggest inspirations that motivate you? YouTubers such as Samika Vlogs, Ingrid Nilsen, Mimi Ikonn and Lilly Singh really inspire me, I love Gina Rodriguez, and most importantly, my parents have really taught me a lot. 4. If you could choose to go anywhere in the world, where would it be? I’ve always wanted to go to New York to experience the culture and its magic; hopefully I will get there soon! 5. If you could travel through time, which time period would you go to? It’s perhaps not the most glamorous answer I admit, but I have always been fascinated with the Victorian Era, especially its authors and their portrayals of life then, so I would love to experience the Victorian Era for a day. 6. Name three things you never leave the house without: my Nomination charm bracelet, my phone and headphones. 7. Any favourite poem or book? I don’t think I could pick one particularly, but Charles Dickens is my favourite author and I also enjoy Robert Frost’s and Robert Browning’s poetry. 8. What do you do on a lazy day? If I’m having a lazy day, I love lounging around, catching up on all the YouTube videos or TV programmes I haven’t had a chance to watch. But I also like to workout or go outside and breath in some fresh air. 10. What piece of advice would you like to share? In a nutshell, life is all about balance. A balance between selflessness and selfishness, hard work and relaxation, looking forward and learning from the past, taking risks and taking your time. Don’t get caught up in what other people are doing, but fight for the life you dream of having, and remember to enjoy and be grateful for the life you have at the moment. What is a goal you have for 2015 that you are particularly excited about? What is your favourite place or place where you feel most at home? What would you say is one of your biggest achievements so far? If you could witness an event from the past, present or future, what would it be? What one piece of advice would you tell your past self? If you could spend the day with a fictional character, who would it be? 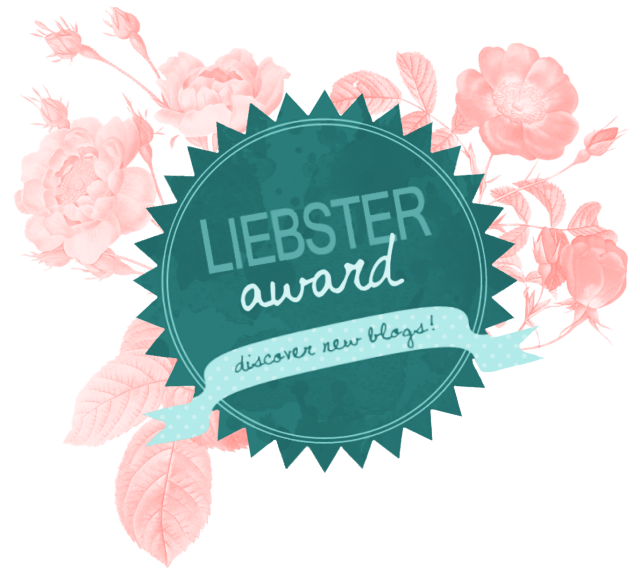 Finally, please feel free to answer the questions and spread the message of the Liebster Award even if I haven’t nominated you, as all bloggers here on WordPress who dedicate themselves to their site should feel proud of their achievements, deserve the recognition and are already part of the community!